Southern brides are well-known for their ability to create a dream wedding, and you naturally want your ceremony to be remembered as one of the best ever. The tricky part is managing to be creative and still stay within your budget. After all, you need some money left over for the honeymoon! We can help. Here are 15 great ideas for a beautifully decorated wedding ceremony and reception that will save money and ensure that your special day is spectacular. Location: This is a great way to save a little cash. If the venue is in a gorgeous setting, you won’t have to decorate as much. Flowers: Choose in-season blooms for the best prices. Potted plants make a beautiful addition to any ceremony, and they are less pricey than floral bouquets. Also, add some baby’s breath, or strings of twinkling lights for added effect. Lighting: Add a little more color by using colored light bulbs that match your wedding color scheme. Flameless Candles: Flameless candles add charm without wrecking your budget. Place candles on mirrored bases to add a bit of elegance. Natural beauty: Use fall foliage or spring flowers as backdrops or to accent doorways or arches. Recycle decorations: After the ceremony, move some of the floral arrangements to the reception area to save money. Use bridesmaid bouquets as table decorations. Use some things from home: You’d be surprised at the things you can find right in your home such as baskets, frames, candle holders, jars, vases, plants, fabrics, furniture and more. These work great for a vintage or rustic-chic wedding. 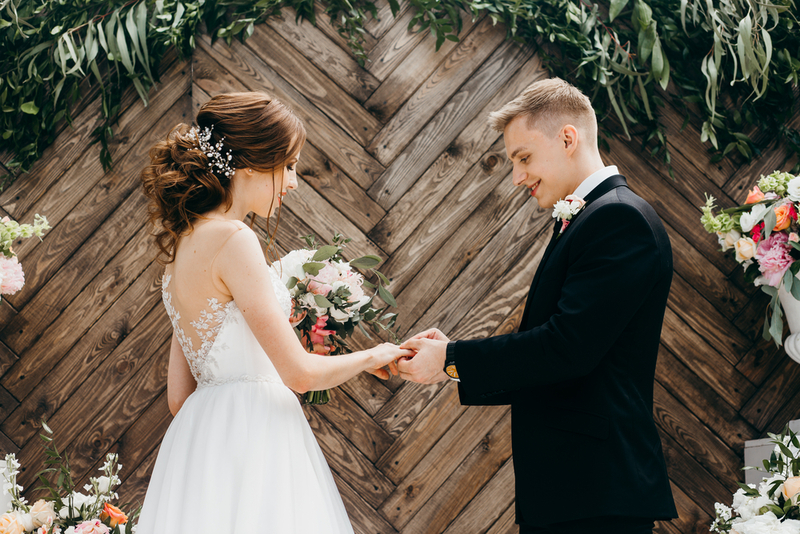 Borrow from friends or family: Some of them may have recently gotten married and may have some leftover items you could borrow. Or, they might have some things around the house you can use. Frames: Check your local thrift stores for a variety of inexpensive frames. You can use these to make chalkboard signs. If you don’t like the color of the frame, they can easily be spray-painted to match your color palette. Balloons: Used in the right way, balloons add a touch of whimsy and beauty. For instance, large white balloons can be used as a backdrop for the ceremony. Helium balloons look great in table centerpieces. Use lots of Tulle: Tulle is inexpensive and useful in many ways. One of the most popular is to create a canopy effect by draping it down from the ceiling and down to the corners of the stage or altar. It can also be used to make bows for the pews or chairs. Shells for a southern touch: Most southern girls have a collection of seashells. Use the shells in clear vases or hurricanes for a beachy look. Use flower petals: These are inexpensive compared to actual flower arrangements. Sprinkle them in various places around the venue just before guests arrive. Bubbles: This trend is catching on lately. Rent a bubble machine to add a bit of whimsy and beauty. Less is more: If you overdo it with the decorations, the effect can be distracting and may seem cluttered. Some strategically placed and wisely chosen pieces are the best way to go. The ideal venue for your wedding is one that accommodates all your needs without blowing your budget. At The Cabin at Old Spur, we provide the amenities you need at an affordable price. Our venue is conveniently located between Hartsville, Sumter, and Florence. You’ll love our wedding pavilion that overlooks the lake. Not to mention the brides/bridesmaid room where you can prepare for the ceremony. If you would like to know more about our features and availability, please contact us today. We look forward to being a part of your memorable day. Me and my fiance are looking for a beautiful place with reasonable prices to have our wedding hopefully in March 2019. Can you please send me some prices and what all that yall offer?